Staying in a hotel the night before your cruise is sometimes essential, especially if the departure port is a long way from where you call home! For our Alaska cruise, leaving from Seattle, WA (a six hour flight from Boston), a pre-cruise night was definitely necessary. After comparing prices, examining amenities, and considering location, a one night stay at Hotel Five in Seattle was the perfect choice. There are two main cruise ports in Seattle, Pier 91 and Pier 66. While you may feel tempted to stay at a hotel right next to your departure port, Seattle is a city that has so much to offer and is easy to get around by foot, public transit, or other low cost options like Uber, so why not do a little exploring while in town. 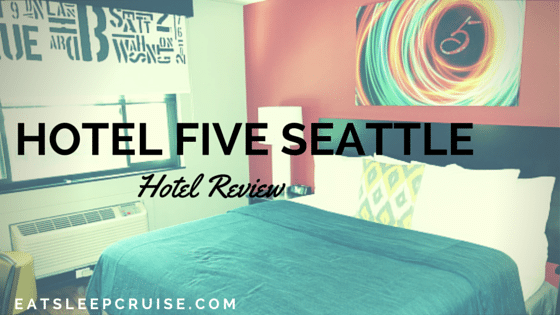 We chose to book a pre-cruise stay at Hotel Five Seattle, a member of the Pineapple brand, as it is centrally located, being only a 10 minute walk to Seattle Center- home of the Space Needle, Chihuly Garden and Glass, and the EMP Museum. This hotel is also only about a 20 minute walk to Pike Place and the Seattle Waterfront area. Hotel Five is an approximately 30 minute drive from the airport depending on traffic; however, there is no airport shuttle, so you will need to arrange your own transportation. We simply opted for a taxi. Although once at Hotel Five Seattle, you are located right on a transit bus line making it easy to do a bit of sightseeing in this great city. We found it more enjoyable to explore on foot instead given that the weather was beautiful during our visit- unseasonably warm and atypically sunny! The hotel is situated in a tranquil, urban neighborhood that is distinctly Seattle. The city just has a more subdued and casual feel to it, unlike the hustle and bustle of Boston. Here, pedestrians actually wait for the “Walk” signals before crossing the streets. What a foreign concept to us East Coasters. Being a city hotel, everything is very compact. Upon entering the lobby, you are greeted by a small sitting area to your left, the lobby desk in front of you, and just beyond this area is the hotel’s restaurant, Max’s Cafe which has good reviews on Yelp. We did not dine at the restaurant, so have no feedback of our own. 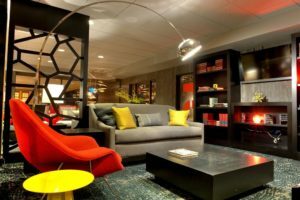 Very urban-chic, this hotel reminded us of a Kimpton Hotel with bold decorations, sleek design, and trendy presentation. Service was very friendly and courteous, but not as formal. It was very fitting with the casual vibe of Seattle and the Pacific Northwest region. Upon arrival, we were quickly checked in by the front desk attendant, and even though we were early, a room was ready. There was assistance offered to help us with our 100+ pounds of luggage, but we managed to roll these behemoths into the elevator and head up the one floor to our room. Throughout our stay, everyone at the hotel was very helpful and accommodating, offering us maps of the city and suggestions on places to visit and restaurants to eat, etc. Actually, for our return flight home to Boston, post-cruise, the hotel was nice enough to let us store our luggage for the day at no charge. This enabled us to spend a second full day touring the city before our flight home, without having to cart around the extra baggage. Two big thumbs up for customer service at Hotel Five Seattle! Being on the second floor, we had a nice view of Fifth Avenue, but we could not really see much beyond that. The decor in the room matched the chic style found throughout the rest of the hotel, making you feel like you were in a more swanky and expensive hotel. It was hip and sophisticated, just like the Princess! The room was nicely laid out with a well appointed bathroom immediately to the right as you entered the room. It also offered plenty of space off to the side of the bed for us to store our multiple pieces of luggage. Even though it was a city hotel, we did not feel cramped at all. 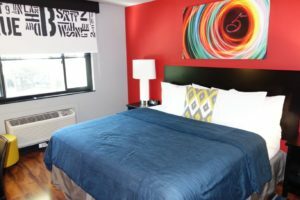 We did not spend too much time in the room, essentially changing up and sleeping, but the room more than meet our needs for this pre-cruise stay. The bedding was soft, and the writing desk with charging area gave us plenty of space to lay out our travel documents and electronics. Free WiFi is included in the room rate which allowed for some social media check-ins and emailing during our downtime in the evening and the next morning. After a long day of sightseeing, the hotel hosts an afternoon reception with coffee, some sweet treats, and fruit infused water. We certainly took advantage of this mid day pick-me-up after our self guided tours of Seattle. Hotel Five also provides unlimited in-room bottled water and Keurig coffee. Check-out the next morning was quick and easy, and the hotel was able to arrange for a taxi to take us to the pier for a total of $18- not too bad for two people and a ton of luggage. 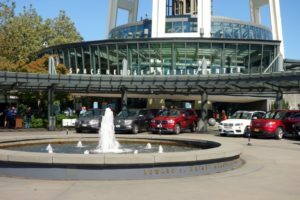 Even though Hotel Five Seattle does not have shuttle service to and from the Seattle airport or cruise terminal, there is a free shuttle available from the hotel to bring you around the city to many of the main attractions. 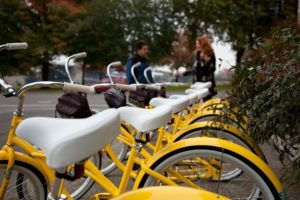 If you want a more eco-friendly way to get around the city, this hotel also offers a free bicycle check-out program for guests. You can access bikes, helmets, and locks to set out on your own self-guided tour of the city and get some exercise at the same time. While we did not take advantage of this option, there were plenty of bikes available, and we did see some fellow guests making use of this eco-friendly method of travel. Hotel Five Seattle is also pet friendly. In fact, the whole city is very dog friendly. So, if you are not traveling on a cruise but thinking of vacationing in Seattle, this hotel will accept your furry, four-legged friends. Booking the hotel about six months in advance and using our AAA discount, we were able to get the room for just around $200, pre-tax and fees. Similar rooms with comparable amenities and style were going for close to twice that cost for the one night stay! The hotel was a steal if you ask us as you got high end features and service for a moderate price. The location was perfect too, being only a short walk or car ride from anything in the greater Seattle metro area. 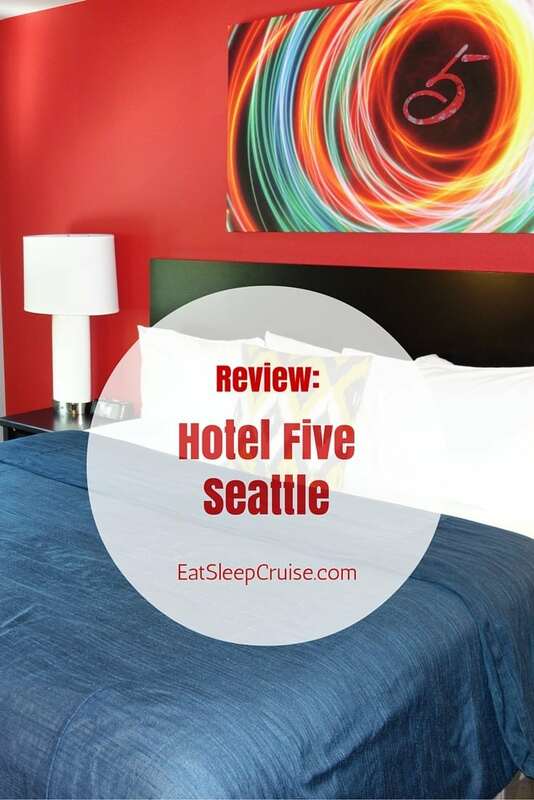 Next time you are cruising from Seattle, or visiting for any reason, Hotel Five Seattle should be on your short list of accommodation options. We will be sure to try other Pineapple Hospitality locations when we return to the West Coast. Have you stayed at the Hotel Five Seattle? Is there another hotel you prefer in the Seattle, WA area? Drop us an anchor below to give your fellow readers some suggestions and tips about which hotels are the best for pre-cruise or post-cruise stays when taking an Alaskan cruise from this port.